From the award–winning author of the Dominion of the Fallen series comes a dark retelling of Beauty and the Beast. Contains mature themes. In a ruined, devastated world, where the earth is poisoned and beings of nightmares roam the land . . . But Vu Côn, it turns out, has a use for Yên: she needs a scholar to tutor her two unruly children. She takes Yên back to her home, a vast, vertiginous palace-prison where every door can lead to death. Vu Côn seems stern and unbending, but as the days pass Yên comes to see her kinder and caring side. She finds herself dangerously attracted to the dragon who is her master and jailer. 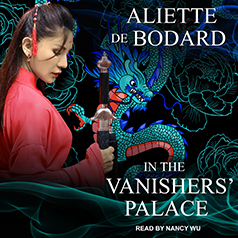 In the end, Yên will have to decide where her own happiness lies—and whether it will survive the revelation of Vu Côn's dark, unspeakable secrets . . .